Sitting in the upper thousand meters of the ocean surface is a scientific conundrum. What scientists believed was happening to the carbon pulled from the atmosphere, and later sank to the seafloor, may not be correct. Diatoms, which reside in the upper layer of water receiving light (~100 meters), are microscopic plants with glass shells which are vital to the oceanic food web. Diatoms use photosynthesis to grow and make organic matter. To do this, they pull carbon dioxide from the atmosphere just like land plants. But since diatoms live only a few days to weeks, many end up sinking to the ocean floor, after being eaten by microscopic animals. Scientists trying to determine the amount of carbon stored in the seafloor have used the glass in diatoms shells as a way to determine what group of organisms bring carbon to the seafloor. However, new research determined diatoms may not be working alone in bringing carbon and silica (glass) to the ocean depths. In the dark depths below which diatoms reside, the single-celled animals (zooplankton) with glass shells, known as Phaeodarians, have been observed to be more abundant than scientists knew and this may change how we understand the movement of carbon and silica to the sea floor. 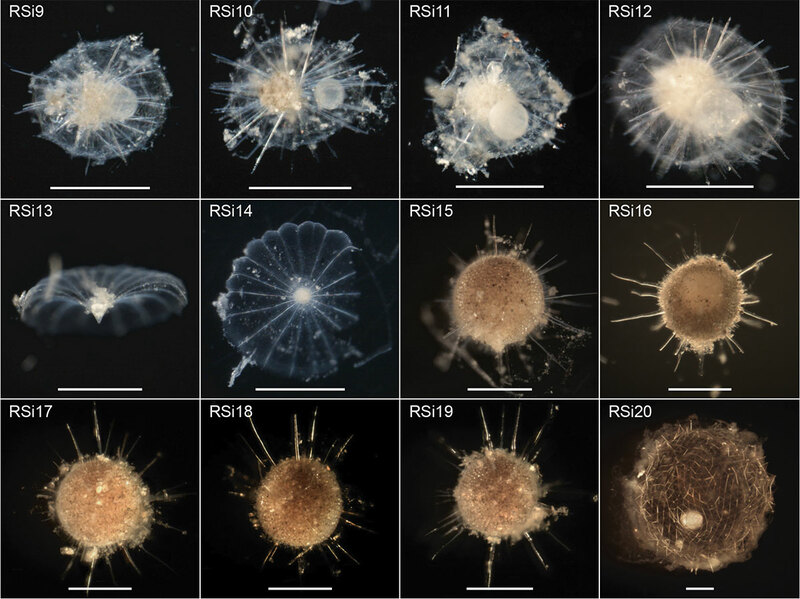 According to paper published in the journal Limnology and Oceanography, Phaeodarians use their silica shells like a net to catch microscopic plants and particles from the sun-lit waters above their dark habitat. 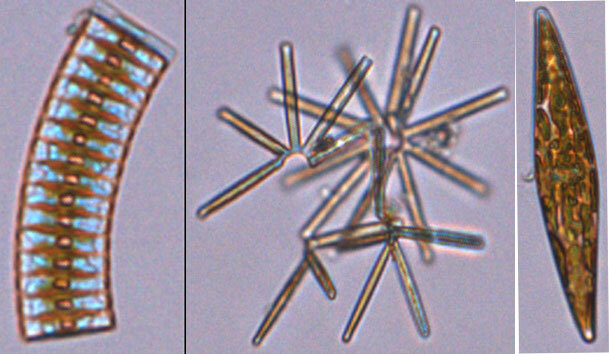 Because Phaeodaria are abundant and have glass shells, their contribution to carbon and silica (glass) may be as or more important than diatoms in many systems. While scientists have known about the flea-sized Phaeodaria for a long time, only recently have they been able to accurately sample this species of zooplankton. Phaeodaria are fragile and most sampling approaches will destroy the cells during collection. These small creatures also do not preserve well in sediments. With the help of a submersible camera system called an Underwater Vision Profiler or UVP, Phaeodaria can be counted in the images without damaging the cells. The UVP is able to image everything as it moves vertically through the water column, down to 5,000 meters. Dr. Biard took images from the UVP he collected, along with the expertise of Dr. Krause, Dr. Mark Ohman, co-author and head of the California Current Ecosystem Long Term Ecological Research program at Scripps Institution of Oceanography, and Florida State University’s Dr. Michael Stukel, to uncover a piece of the puzzle at the bottom of the food web. “We looked at their (phaeodaria) silica shells. We were shocked that in some processes they may be as or more important than diatoms,” Dr. Krause explained. Because images cannot be directly examined for carbon and silica (glass) content. The scientific team led by Dr. Biard gently caught individual Phaeodaria by hand off the Scripps Institution of Oceanography - dried them, and sent them to Dr. Krause for further research. “Holding the test tube in hand, you can actually see Phaeodaria. They’re about the size of a flea and nearly transparent,” Dr. Krause said. Dr. Krause - who specializes in diatoms and silica - applied his skillset to understand the silica content of single Phaeodaria skeletons. By understanding how Phaeodaria silica increases with size, Dr. Biard and colleagues were able to use size information from the imaging system to estimate silica content for Phaeodaria, and make unprecedented measurements of their contribution to the sinking of silica in marine systems. “Given the archive of data Mark had on hand, and Mike’s efforts in the field and connecting the authors, we came together and produced something unexpected and of wide interest in our field,” Dr. Krause mentioned. This work was recently highlighted in the American Geophysical Union’s EOS Earth & Space Science News publication, and a figure from the publication was the cover image for the latest issue of the journal Global Biogeochemical Cycles. This work, combined with on-going projects by Dr. Biard and Dr. Krause’s colleagues in France, is redefining the role of Rhizaria in the global silica cycle and revising ideas which have been the standard for decades. “These are exciting data, and they have opened the door to many new questions,” Dr. Krause said. Biard, T., Krause, J. W., Stukel, M. R., & Ohman, M. D. (2018). The signiﬁcance of giant Phaeodarians (Rhizaria) to biogenic silica export in the California Current Ecosystem. Global Biogeochemical Cycles, 32. https://doi.org/10.1029/2018GB005877.